It’s not difficult to look good in a suit. If you’ve got the money and an experienced tailor who knows what he or she is doing, then you can’t really fail. Simply hand over your cash, listen to their sartorial know-how, and allow them to stitch you something that’s made to flatter the contours of your body. All you have to do is tie your tie. But, things are not so easy with casual dress. A suit is a uniform that complements itself, but there is no such copout with casual dress – you have to mix and match different garments on your own, and there is no tailor to hide behind. For so long, the suit was the default attire for men. But now, with fewer people having to wear them for work – one in ten people now wear one to work according to one survey – they are focusing more time and spending more money on their casual clothing. But where to start? There are numerous business casual and smart casual dressing guides out there, but what about looking good when dress codes don’t apply? Casual dress for men can be traced back to that most stylish of decades, the 1950s. The war was over, and teenagers in the UK and America wanted a something different, a life that contrasted with the austerity of conflict and the boredom of the corporate world. So, suits and the stuffiness or formal clothing were out, and jeans, freedom and rock ’n’ roll were in. Films such as Rebel Without A Cause and The Wild One had a significant impact, and music stars such as Elvis Presley and Little Richard only further cajoled the original youthquake. The new mood was one of excitement and passion, rather than suppression and rations, and the anti-establishment uniform of jeans, T-shirt and leather jacket best encapsulated this. The biggest style takeaway from this period, and one that will likely always influence the way we dress is denim, and specifically denim jeans. While they were invented as part of a uniform for gold miners on the west coast of America around the turn of the 20th century, they were reborn in the ‘50s as a staple of casual, anti-conformist dress. Since then, in every decade they’ve formed the backbone of casual attire, whether bleached and flared in the ‘70s, high-waisted in the ‘80s, acid washed in the ‘90s or skin tight in the ‘00s. Today, jeans continue to rise – predicted global sales will soar another 8.40% by 2021 according to market research firm Techavio. So, while it’s hardly breaking news, if you’re stuck for where to begin with your casual wardrobe, take a leaf out of Dean and Brando’s book. What Is Casual Dress Today? The first rule of casual dress right now is that there are no rules. You can, quite literally, wear what you want and be considered ‘casual’, but therein lies the problem. There is no direction, no predefined set of rules. One answer for some men is to follow the crowd. Next time you go to the pub on a Saturday night, spot the gaggles of identikit drinkers all decked out in jeans and some form of untucked shirt. There is nothing wrong with this, of course, but to stand out in casualwear, conversely, takes a bit of effort. Then there are the shifting goalposts of casual dress. With the demise of the suit’s popularity, fashion brands have realised that casual clothing is where people are spending the most money. This at least partly explains why Gucci, Dior, Prada, Louis Vuitton et all – luxury fashion houses with over 400 years of combined history – have essentially become ‘hype’ brands, reacting and collaborating with the highly lucrative streetwear market currently dominating the industry. Up until a few years ago these brands didn’t stray too far from traditional tailoring in their men’s collections, but now anything goes, from £400 sliders to monogrammed LV X Supreme hoodies re-selling on eBay for eight grand. And that’s before we get started on Balenciaga, or Vetements’ ‘DHL’ T-shirts. Is it possible to dress well casually without buying into this ridiculousness? Well, yes. Yes, it is. In actual fact, that is the beauty of casual clothing. Unlike with tailoring, where you generally have to fork out a substantial amount to buy a fine suit, you can look ace on very little budget. Just follow our pointers below if you’re stuck on where to start. These ‘rules’ are not set in stone and are merely suggestions, but they are a good place to start if you’re looking for casual style inspiration. As with tailoring, fit can make all the difference with casual attire. The difference is, you don’t always have to look tailored. How should your clothing fit? This really depends on the look you’re going for and your body type. Traditionalists will say that a slim-but-not-restricting fit should be the ideal to aim for, but there’s been a shift towards looser styles in reason seasons, with boxy shirts, and outerwear, and wide-legged trousers proving popular amongst designers and fashion-forward consumers. That said, there’s still an argument for slimmer fitting clothing that flatters the wearer’s body shape. The point is, fit is one of the most important aspects when it comes to clothing and it should be considered above all else. There’s no use investing in hoards of the latest streetwear if you don’t feel comfortable wearing it. Wear what feels right to you, because if you feel self-conscious then this will show and it won’t matter how many hundreds you’ve dropped. Minimal style is not necessarily en vogue right now; rather, loud logos and oversized statement pieces are where it’s at… for some. 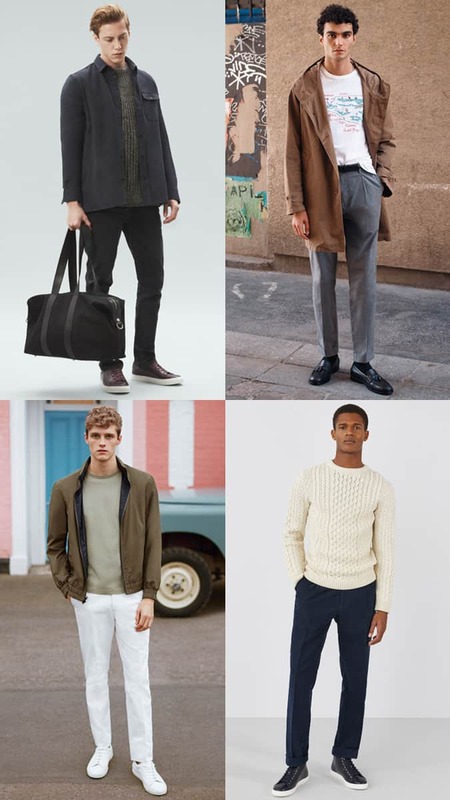 But simple, pared-back clothing will never not be cool, so swerve the masses and combine easy, straightforward garments together for an effortless take on casual style. Turn to A.P.C., AMI, and Whistles for inspiration, or look to high street brands such as COS and Arket for well made takes on unfussy clothing. Take a denim jean and T-shirt combination; it’s arguably the archetypal casual ensemble, yet it still can be worn in numerous ways. Tuck, half-tuck or untuck the T-shirt? Roll the sleeves or leave them be? Pinroll the jeans or have them tailored? Slim or relaxed cut jeans? These are all subtle tweaks and variations, yet they make a fairly substantial difference. Many people find the idea of a ‘uniform’ stifling and restrictive, but for others it’s an exercise in simplification and reduction. Find a way of dressing that’s easy and effortless, not dissimilar from wearing a suit in the sense you can get up, throw it on and head out the door. You’ll find yourself saving time during your morning routine that you can spend on coffee, or sitting on the edge of your bed pondering the big questions. Or looking at memes. 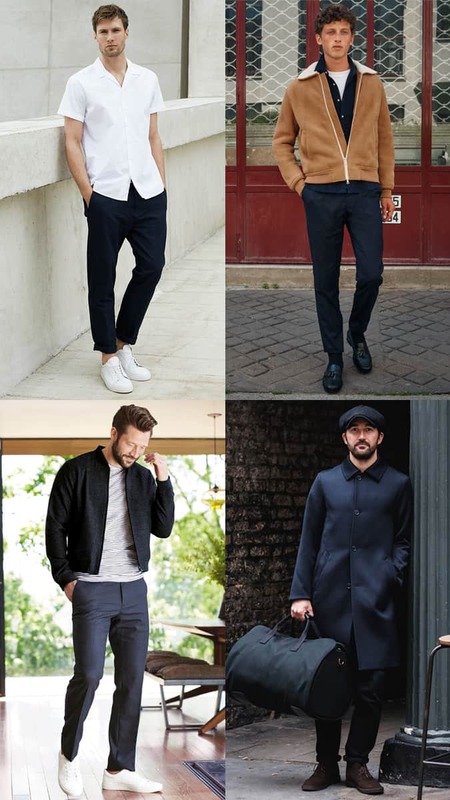 A casual uniform can be found in style – a rotation of navy trousers, white Oxford shirts and white sneakers perhaps, or colour; a preference for black could mean that black jeans and a leather jacket becomes a uniform for you. Google ‘Jeff Goldblum leather jacket’ to see what we’re talking about. Casual style is dominated by trends, from high street to high end. Whilst this is all well and good, the very nature of trends ensures they will fall out of favour soon enough. So, if you want to future-proof your wardrobe, it’s preferable to only dabble in trends and instead spend big on pieces that will last – a solid bomber jacket, rather than the aforementioned Vetements DHL T-shirt, for example. A good rule of thumb is to utilise just one ‘trend’ item per outfit – a logo baseball cap, perhaps – and keep the rest classic. Of course, you could just ignore the above and wear what the hell you want. There are no limitations to casual style, so feel free to experiment and discover what works for you. It would be boring if everyone dressed the same anyway. That said, here are some classic casual garments to get you started. According to Nick Ashley, creative director of Private White V.C., “menswear has been casual since the Second World War – men couldn’t wait to get out of uniform”. One of the garments they did want to wear though was jeans. The backbone of casual wardrobes since the 1950s, denim jeans are a staple and can form the basis of numerous off-duty looks today. While their popularity has never dwindled, there’s been a rise in the popularity of artisanal denim in recent years, with many brands making use of high-quality raw denim that’s put together on vintage looms, in the way they would have been made 50 years ago. Go this route and you’ll pay a bit more, but you’ll enjoy a pair that will last decades and will only get better with age. Today the humble T-shirt can be worn with anything, even tailoring, as John Harrison, creative director of Savile Row tailor Gieves & Hawkes notes, there’s been a “shift to styling the suit with T-shirts or crew necks, especially with summer tailoring”. So it’s basically official: there’s nothing the T-shirt can’t do. Naturally, there are many variations on the ubiquitous garment. Look out for a good quality cotton – Uniqlo’s Supima cotton is a good, affordable place to begin – and a flattering cut. For a point of difference go for a thin Breton strip – a summer staple – or a knitted version, of which Mango produces a solid linen take. Trainers are being worn differently today too, and can be taken out of their sportswear niche to tone down more traditionally formal attire. Robin Winch, co-founder of luxury luggage brand Bennett Winch says, “It feels as though people have become more knowledgeable about how to wear their clothes; you’ll see some guys wearing tailored trousers with a vintage jacket and a brand-new pair of Nike trainers. It’s a cool juxtaposition.” It’s arguably the trainer’s versatility that has made it the most covetable shoe style of today. White trainers are still the most ‘classic’, and can be worn with the widest array of styles – go for leather if you want something slightly smarter. But, for an injection of character, opt for off-white – they don’t look so blindingly fresh out the box – or a pair with a contrasting gum sole or subtle branding. They’ll still be easy to wear, but are slightly more interesting than plain white. From the bomber jacket to the denim trucker, lightweight outerwear can add plenty of individuality to a look. The latter option is a good place to start, and has been favoured by numerous style icons over the years “from George Harrison in the ‘60s to Rihanna wearing them today”, says Cheung. Whatever style you go for, it’s worth spending as much as you can and investing in something that will be worn for years, as with outerwear you generally get what you pay for. A good in-between layer, a loopback sweatshirt or thin Merino knit are both easy to wear, laidback options for cooler days. Wear them as an outer layer or underneath a lightweight jacket and you can’t go too far wrong. The loopback option used to be reserved solely for the sporting arena, yet has now firmly infiltrated the casual menswear canon – opt for classic grey or off-white and wear liberally. Similar to the T-shirt, a Breton stripe can spice things up – look for a knit with a solid base of navy with a white over-stripe and calmly await the French fisherman remarks from less stylish friends. Elsewhere, a knitted polo will do the trick if you’re after something slightly sharper – pair with your selvedge denim and you’re good to go. In relatively little time at all the backpack has become the new luggage norm. Out of nowhere it’s somehow shed its college student/gap year status and now any brand worth its salt is producing its take on the ubiquitous style. This is at least partly due its practicalities and functional qualities and is very much in line with the more casual way that many men are dressing. This entry was posted by Epiphany in Style. Stay updated with accessory and grooming trends for men.